Claregalway County Minor A Champions: Back row: Danny Prior, Daniel Loftus, Dylan Buckley, Ian Fitzmaurice, Conor Campbell, Keelan Grainger, Sean Kilmartin, Luke Roache, Padraig Commons, Mathew Kilgannon, Philip Dolan, Tiernan Collins, Broin Connolly, Paul Culkin, Dylan Walsh, Maurice O’Brien, Colin Carr. 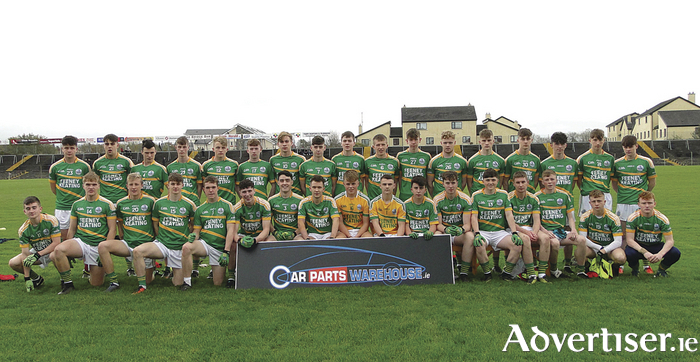 Front row: Dara Whelan, Conor Walsh, Diarmuid Mullins, Sean Lyons, Jack Glynn, Jason Reilly, Barry Callanan, Iarla Keating, Conor Flaherty, Mark King, Cian Daly, Thomas Cogley, Aaron Molloy, Keith Field, Jarlath Commons, Ryan O’Sullivan, Eoghan Gallagher. On a high quality and entertaining final with Salthill, the North Board men only led by a point, 1-06 to 1-05 at half-time. However, a Keelan Grainger goal in the second half was a crucial moment in the game, and put John Kilmartin's team into a solid 2-09 to 1-7 lead they never relinquished as they ran out worthy victors by 3-12 to 2-09. They had big displays from full-back Barry Callanan, centre-back and dual star Matthew Kilgannon, who also won a county minor hurling medal with Castlegar in the past fortnight. Team captain Luke Roche at wing-back and Jack Glynn, who sallied forward with fervour, also impressed. Up front free-taker Padraig Commons was in good form, and All-Ireland minor hurling star Conor Walsh also caught the eye. Keelan Grainger did a lot of damage on the Salhtill rearguard and ended with a tally of 1-05 in a super display. Salthill tried hard, but with so many young players in their ranks, and missing full-forward Calym Crowe, it was asking too much to take down a more experienced and powerful Claregalway panel. Evan Murphy, who scored 0-6, and Eoin McFadden tried hard. Cathal Sweeney and Aidan Halloran also notched a goal each. Claregalway team manager John Kilmartin was understandably delighted with his side's victory. "It is a fabulous achievement. It was a very hard earned win as we expected. Any team that Anthony [Finnerty] is over will be well organised and committed. We knew we would have to produce a big performance to get the win. "There are a lot of young players on the Salthll panel and a good few of them won an U16 title last weekend, so they are a side that will come back again next season. We are delighted to have come through. "While it was terrific to win the minor title, our aim is to bring as many of these lads through in the future to play intermediate and senior football with Claregalway. And we are looking forward to the Connacht championship at minor level, and we'll see how we go in that."